Physiotherapy treatment can significantly improve symptoms and function in patients who have a lumbar spondylolisthesis. Spondylolisthesis is a condition where one vertebrae slips forward on the one below. 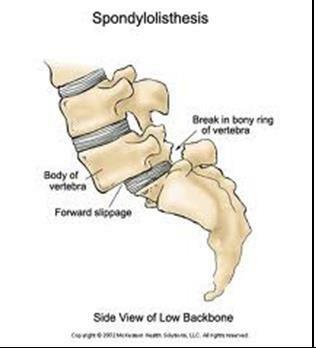 The most common level for a spondylolisthesis to occur is at L5S1. Predisposing factors include the presence of bilateral pars defects (these can be developmental or the result of trauma such as stress fractures), chronic disc disease leading to loss of disc height and associated facet joint degeneration, and excessive anterior pelvic tilt (usually due to muscle imbalances around the lumbo-pelvic region) which leads to increased shear at the L5S1 spinal level. Research has demonstrated that specific physiotherapy intervention for patients with lumbar spondylolisthesis can significantly improve their function, decrease their pain, and decrease their need for medication. Move Well Physiotherapy offers real-time ultrasound imaging (RTUI) of the lumbar spine stabilising muscles (transversus abdominis, lumbar multifidus and pelvic floor) to correctly retrain the function of these muscles to improve spinal stability and function. This can be an essential component for successful rehabilitation of this condition. Initial treatment for patients with spondylolisthesis includes techniques to decrease spinal pain and education on the condition and how to avoid further injury. Exercises are introduced to retrain the stabilising muscles of the lumbar spine, and to mobilize and strengthen the spine generally. Exercises are also introduced to improve muscle length and strength around the lumbo-pelvic region as specifically indicated for each patient. Your physiotherapist will also commence movement retraining to teach you how to move efficiently without placing undue stresses onto your spine and help prevent progression of this condition.